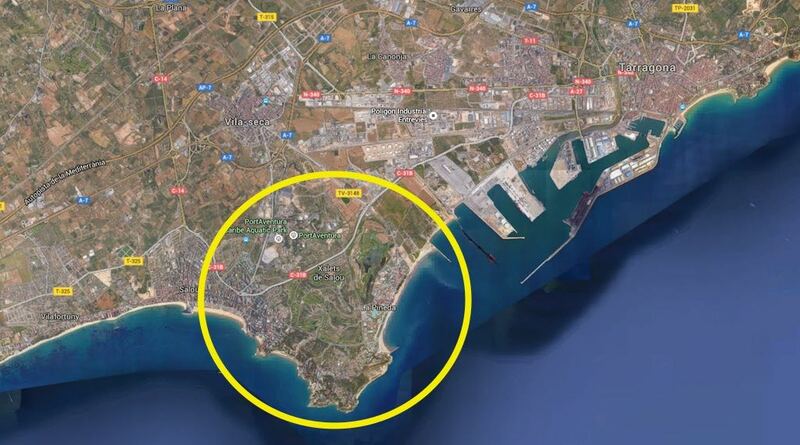 Formerly known as ‘BCN World’, the project to build a big hotel, casino, golf, and residential development in Catalonia’s Tarragona province is reportedly going ahead next summer, but with major changes to the original plan, reports the Catalan News Agency. The project to build a holiday resort in the villages of Vila-seca and Salou on the Costa Daurada, near PortAventura theme park, has entered a new phase, we are told. The project will break ground next summer, but with a new name and smaller scope, as a consequence of all the political opposition it has run into. The name BCN World will be dropped, and the total surface area of the project will be 750,000 m2 rather than 1,000,000m2, with only be 2 casinos, instead of the 6 originally planned, occupying a surface area of 30,000m2. The project’s surface area for hotels will also decrease by 29.2% in comparison to what was approved in the 2015 urban plan. The resort is expected to receive €2,500 million from the investors Hard Rock Café Melco and Grup Peralada and 10,000 jobs are set to be created when fully operational. The reorganisation of the project foresees than 96% of the site will go to tourism related to conventions and leisure. In particular, 57% of the site will be dedicated to hotels, 16% to leisure, 7% to commercial use and only 4% to gambling. Another major change is the aim to achieve an improvement of the landscape surrounding the area, reducing the maximum height of the buildings to 75 metres instead of 90. The total surface area has dropped from 600 hectares to 101.7. “This is a worthy project; it generates important investment, is more realistic that the previous ones and more integrated from an urban policy and social perspective”, stated Catalan Vice President and Catalan Minister for Economy, Oriol Junqueras. According to Junqueras, “the previous projects known as ‘Eurovegas’ and ‘BCN World’ are dead and buried”. Although the final name hasn’t yet been decided, there would be an incentive for it to include a reference to the Tarragona area. In February this year, Hard Rock’s president Hamish Dodds and the company’s vice president, Nelson Parker, both expressed the multinational’s interest in setting up an Integrated Tourist Centre at BCN World, which would represent a 2.5-billion-euro investment. By then, the project was on ‘standby’ as the regional Government tried to find the greatest consensus possible amongst the different parties and institutions involved. In a press conference right after the meeting, Catalan government spokeswoman Neus Munté emphasised the government’s will to “enhance the social and political consensus” around BCN World. Munté also highlighted radical left pro-independence CUP’s appreciation and assured that the project is not only based on gambling. “Only 6% of BCN World will be casinos” she explained and defined BCN World as a business tourism resort. Moreover, according to the investors, the project will generate many new jobs in an area which “has been especially punished” by the economic crisis despite having an “excellent” location, explained Munté. According to the original project, the BCN World resort would have consisted of a strip of six Las Vegas-style casino-hotels as well as amusement parks, shopping malls, conference centres, theatres, research institutes, golf courses and a beach club (among other facilities). Initially, the project was expected to generate 17,000 jobs in the construction phase, and subsequently 5,000 jobs per mega-hotel. The investment was announced in September 2012 as an alternative to Sheldon Adelson’s ‘Eurovegas’ project, which was to be built in either the Madrid or Barcelona area. However, in order to make BCN World happen, significant regulatory modifications were needed so as to adapt the urban planning of the area but also modify essential aspects regarding taxation and gambling. Due to political disagreement over the whole project, BCN World was put on hold for several years.